A utility vehicle, also called a side by side vehicle, offers powerful performance and rugged control. Commonly used for purposes such as farming, landscaping, hunting, and other endeavors where you want to get around with ease in a vehicle built for a range of terrains and situations. When shopping for Can Am SxS parts, we offer a complete inventory of reliable solutions tailored to fit the needs of your machine. Whether shopping for spark plugs, decals, or a new seat, we have you covered with all the essentials you need to make the most of this versatile vehicle. While the history of Can Am side by side vehicles might not be as long as other manufacturers, the overall knowledge and innovation of the brand is more than enough. 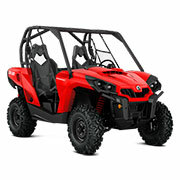 When Can Am introduced their first utility vehicle in 2011, they already had extensive knowledge in the world of ATVs that they applied to their first designs to bring consumers the perfect mix of fun and function. Since then, their models such as the Maverick, Defender, and Commander, have taken over the market with their smooth handling, ability to master several terrains with ease, and the overall quality of the designs. When looking at for a side by side vehicle, there are certain hallmarks or areas everyone looks for, and Can Am has it all. From the impressive 2,500 pound towing capacities at the top of their class to the reinforced low alloy grade steel chassis, these rides are made to work as hard as you do. They are also made with a focus on maneuverability and ease of handling with elements like lockable rear differential, separate front and rear toggle switches, and multiple mode traction systems. These elements all combine to allow you to traverse several different terrains with ease. With so much focused placed on how well the vehicle handles and performs in the most rugged situations, it is no wonder this manufacturer is a fan favorite for side by side drivers. While these vehicles can be used for work purposes, they are also fun for ride around just for recreational reasons. Since they can seat two passengers side by side, they are ideal for riding while sight-seeing or taking in nature. Whether you use it for work, play, or a mix of both, you need the right parts to keep it ready to take on the toughest terrains. We are honored to bring you a diverse selection of affordable Can Am SxS parts to help keep your ride in great shape. With a focus on offering all of their models and the different series within the model, as well as years ranging from the beginning to current, we are confident you will find everything you need when shopping with us for Can Am SxS parts. In addition to offering all of the models, years, and series offered by this trusted manufacturer, we also aim to offer a diverse scope encompassing all of the aspects of the vehicle. Whether you are looking for spark plugs, fuel pumps, exhaust pipes, or bearings, we have you covered with all the important Can Am side by side parts all in one convenient location. Our inventory offers OEM parts direct from the manufacturer to ensure the proper fit and performance for the specifics of your machine. These Can Am side by side parts help you achieve the performance and power originally intended by the manufacturer of your model. Made with quality materials and in the exact sizing needed for the measurements of the selected model series, these parts are built to last while giving superior performance when installed correctly. With a focus on affordability and a wide range of available options, we are confident you will find everything you need with ease. Order today and get your favorite ride back in top shape. Here at Can Am Parts Nation, our goal is to bring you everything you need to ensure the longevity and power of your favorite vehicle. We are committed to delivering high quality products and exceptional customer service with every order. If you have any questions while shopping with us, please reach out for further assistance on the matter. We are always glad to help our valued customers in any way.